Falling asleep at your computer and subsequently banging your head on the keyboard is not a pleasant experience (and I’m talking from experience) as is waking up with keyboard keys etched into your forehead. 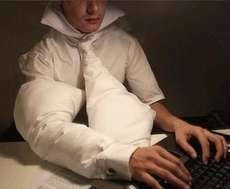 If you’re having one of those workaholic nights when it’s imperative you’re fixed to your computer at all times, this Pillow Suit for Workaholics might just save you from a few bumps and midnight knocks. Or if you’re a victim of narcoleptic fits, this suit is your saviour. Complete with padded tie, collar and sleeves, the padded suit will protect you when your head unintentionally and abruptly drops… providing your head falls in the right direction of course and not head first into the keyboard. You may get a little hot though – I can’t imagine a padded suit will be well vented. There’s no indication as to where you’d be able to bag yourself a cushiony suit, which leads me to believe it could be a concept. If we find out more information we’ll be sure to let you know. The SKY&apos;s the limit for 3DTV: First UK live broadcast last night!